As I have continued to say for some time, I believe we’re in the late stages of a bull market that started following the last recession in 2009. I do expect volatility to be higher in 2019 than we’ve seen in past years. It’s also possible that we won’t see a recession this year although the risks of this has increased substantially. What most economists and Wall St forecasters saw as highly unlikely is now possible. The economic expansion is now 115 months old, the second longest in history. 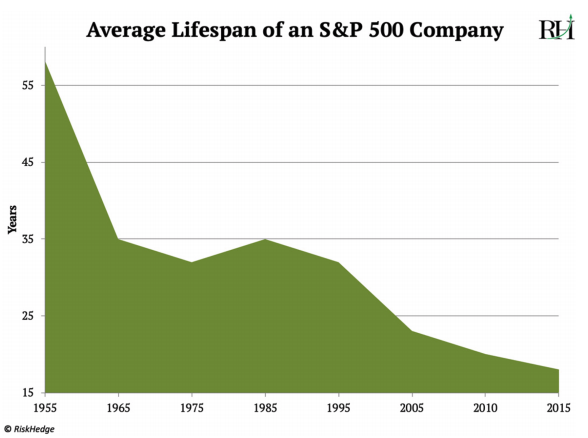 In comparison, the longest expansion lasted 120 months (1991-2001), the expansion post the great Tech bubble lasted 80 months, and the average for more than 100 years is 40 months. 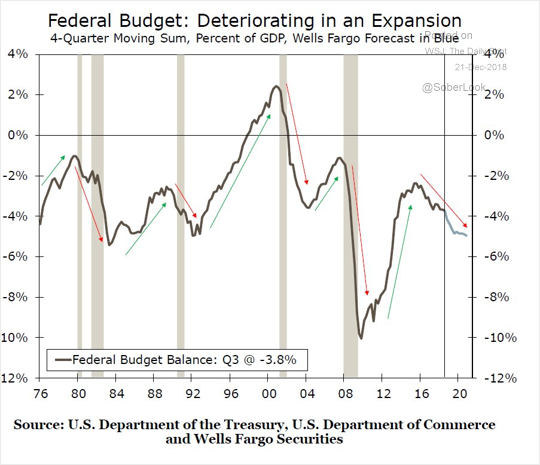 All expansion cycles end with a recession. This one is aged and odds favor a 2019/2020 recession. Recessions reset the system. Weak companies default, pricing power for the strong is corrected, and a new expansion cycle begins. Zero interest rate policy has enabled record high debt. Excessive leverage is the telltale sign. While the stock market is more favorably valued today than in January of 2018 due to margin expansion and a drop in the S&P, markets don’t tend to sit at their long term average for long. Cycles typically start with markets being undervalued then move towards fair value, then overvalued and sometimes extremely overvalued. They’re driven by virtuous circles, confirmation bias and optimism. This same phenomenon is what then causes markets to fall from highly overvalued to fairly valued to undervalued. This is what’s referred as the vicious circle and is caused by the exact opposite of what causes bull markets, pessimism. These are often referred to as feedback loops which can be positive or negative. Another interesting development I’ve witnessed recently is the yield curve doing “odd” things. For instance, on 12/31, here is the yield curve. While the FED funds rate is 2.50%, the 3 month T-Bill is 2.35%. 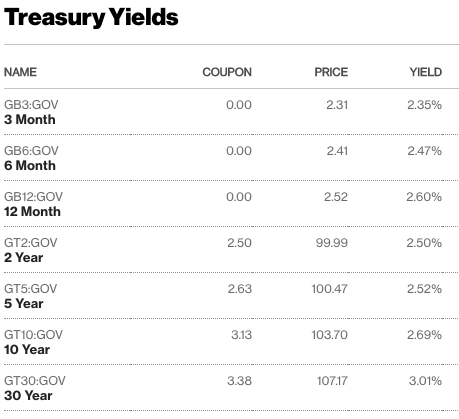 Furthermore, the 12 month T-Bill yield is 2.60%, which is higher than the 2 year, 5 year and even the 9 year (not shown). In fact, the yield curve almost inverts all the way out to 10 years. If you plotted the FED Funds rate at the beginning at 2.5%, it inverts the first part of the curve as well. Ultimately, inverted yield curves typically forebodes recessions in the near future. Anyone who says this time is different and that an inverted curve doesn’t indicate something awry is guilty of not being objective. As I tend to end each 2 cents lately, be careful and wary. While markets are down, they’re not down all that much when compared to recessions. 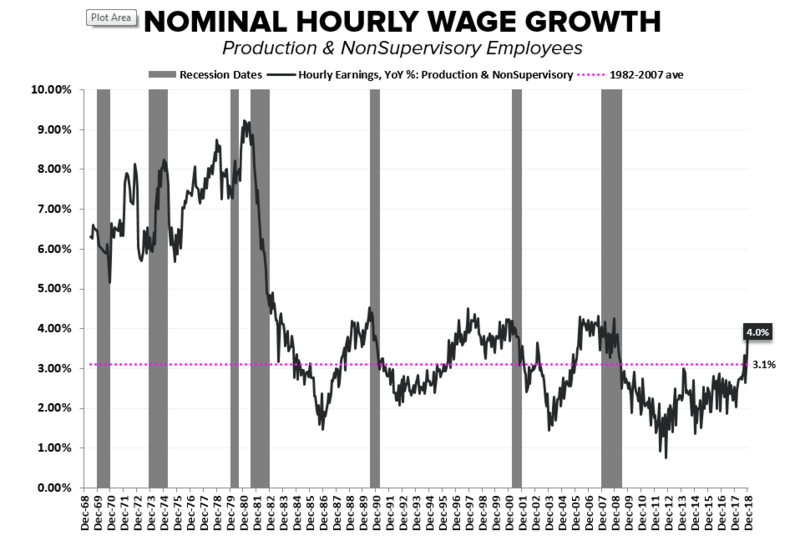 And this next recession could be very bad as global central banks pumped up markets and injected capital and are now trying to wind that down just when growth is slowing/about to slow (country dependent). There’s a large debt wall looming the next few years. 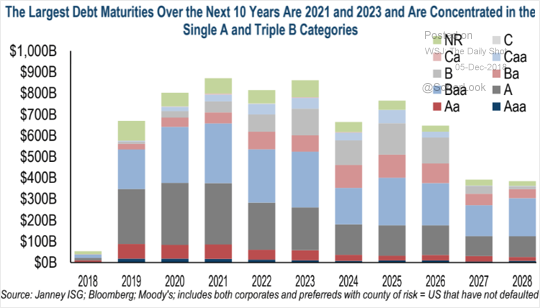 Depending on the economy, this could make low quality debt issuers unable to rollover and refinance outstanding debt at favorable rates The largest issuance comes from A and Baa rated companies. 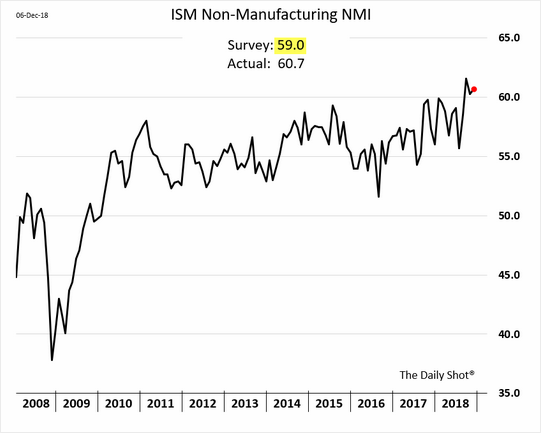 The ISM Non-Manufacturing report remains remarkably strong. If there is a slowdown in economic activity, this index isn’t showing it. 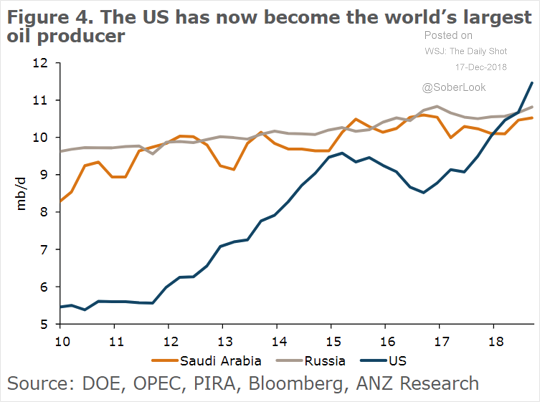 The US has also become the world’s largest oil producer, having just surpassed Saudi Arabia and Russia. 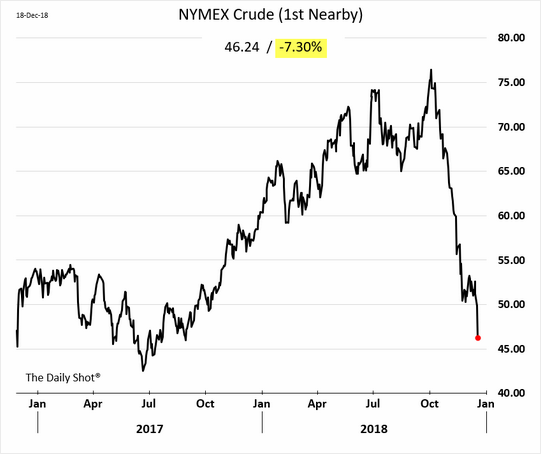 WTI oil futures plunged, hitting the lowest level since July 2017 due to slower growth and increasing stockpiles. High yield bonds (AKA junk) spreads have increased as volatility has increased and signs of a recession are rising. What this means is that the yield investors demand above treasury bonds have increased. 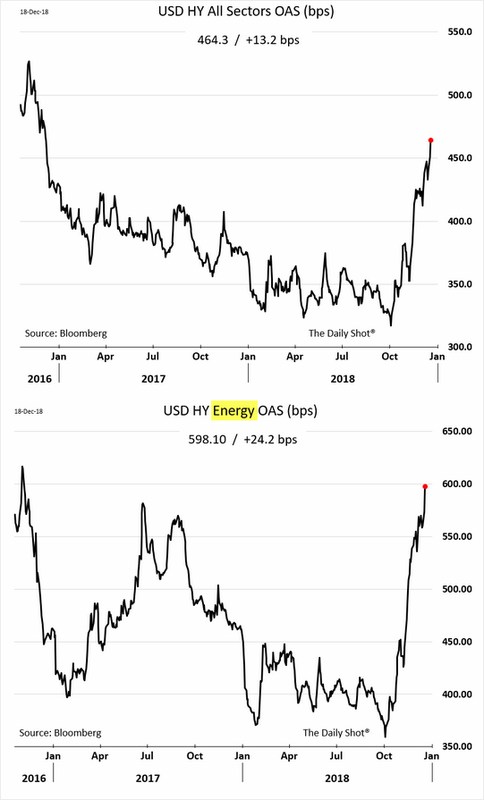 Energy related high yield issuers have seen their spreads increase more than the rest as the price of oil fell dramatically in Q4. 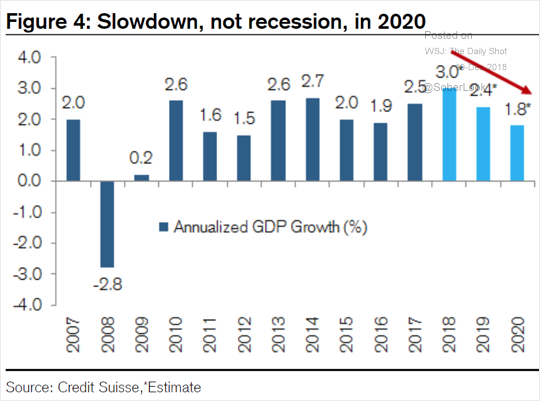 Economists, while not predicting a recession, are predicting a slowdown in 2019 and into 2020. Keep in mind forecasters tend to be off the most with respect to GDP as it’s the most difficult data point to forecast since there are so many moving parts. 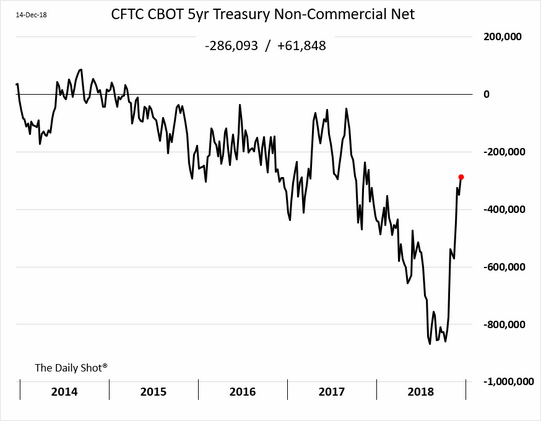 Remember all of those investors who were short treasury bonds as they were betting yields would continue to rise? Well they were wrong (at least recently) and we saw a lot of short covering as yields dropped along with equity markets during December. It’s not often that we see rising deficits during an expansion but that’s what we have with the tax cuts. If we see a recession in the near term, this deficit is likely to grow rapidly. We just saw a solid increase in jobs added and wage increases for December. Since the mid 80’s, we’re approaching a level that has occurred before economic contraction. Remember, increasing wages = bad for corporate profits. 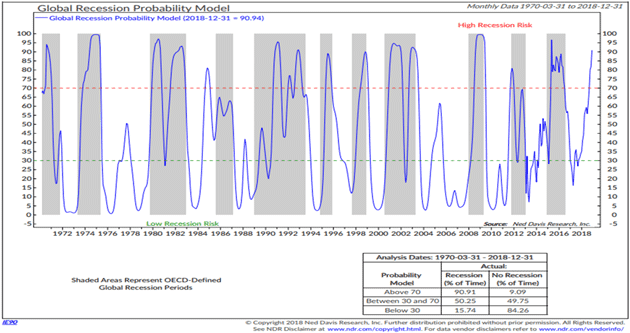 The Global Recession Probability model by Ned Davis Research is above 90 and forecasting a recession. Nothing new here, however this model above 70 forecasts a 90% chance of a near term future recession historically. 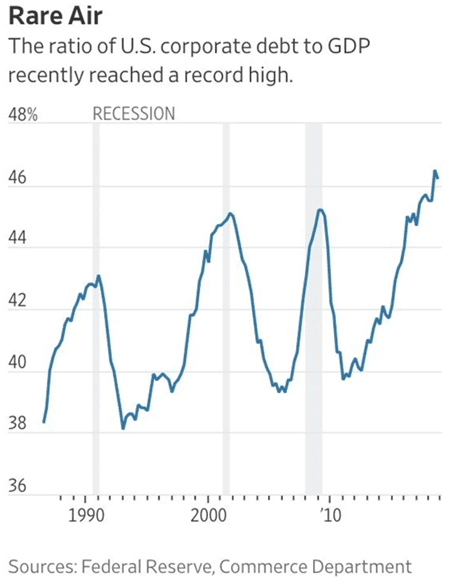 Corporate debt to GDP ratio reached a high recently and may have hit it’s peak for the cycle.